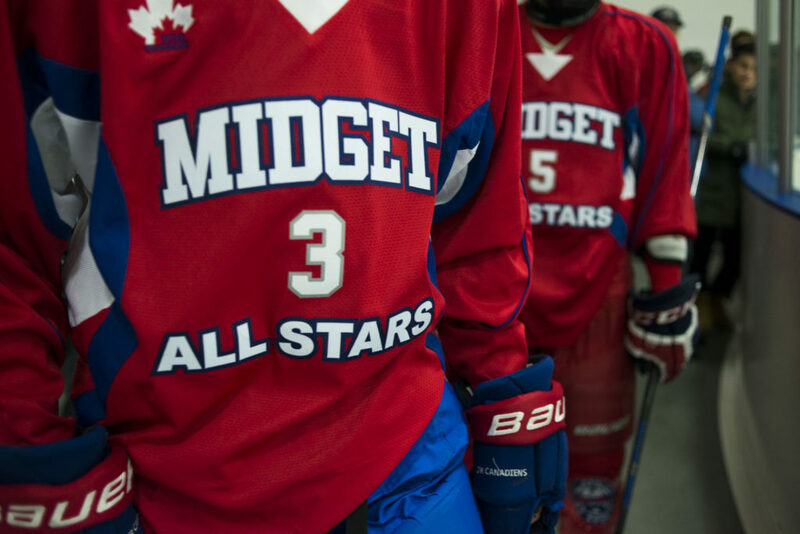 In the midst in the race for the playoffs, the top players from Midget “A” and “AA” divisions put their allegiances aside to prove themselves as all-stars. Forty players from each division were selected by their coaching staffs to participate in the 18th annual event. The balanced play of the first period would not be predictive of the forty minutes that would follow. With the first period ending in a 2-1 Team Red lead, Team Blue would start the second with a tying goal. Five minutes into the second period, Team Red would net six unanswered goals from five different goal scorers, three of which were from the first place Vaughan Rangers squad. The third saw more dominance from Team Red, with team MVP Nicholas Chiappetta scoring his second of the evening. Team Blue managed to get on the scoresheet once in the final period on a goal from team MVP Michael Linardi. Seven players on Team Red had multiple points in the game, including four who recorded three or more points. A back and forth affair highlighted the Midget “AA” game, with both teams taking turns at sharing the lead throughout the game. Team Red would be first on the board, ending the first period with a 3-1 lead. Team Blue came swinging back with all the momentum in the second, scoring three unanswered goals to take a 4-3 lead. Tied with five minutes left in the third, Team Red were able to net two to take the win.